If you're buying a practice read our FREE guide to make sure things goes smoothly! If you’ve found the practice you want to buy and you’ve had your offer accepted, you’ve reached what is probably one of the most exciting yet challenging parts of the sales process. At this stage, it’s important that you know what needs to happen at certain times as your purchase progresses over the next few weeks and months. 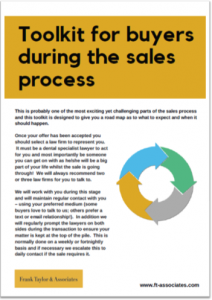 That’s why we’ve put together our ‘Toolkit for buyers during the sales process’. The Toolkit is designed to give you a road map as to what to expect and when it should happen and is available for FREE. Simply provide your details below.